Questions may be asked such as: How can we better honour and respect the dignity of individuals? Perhaps by nurturing their talents, perhaps by helping them unfold their potential, for example, in the field of design? These questions aim at stimulating the dialogue around topics such as diversity versus uniformity. HumanDHS envisions to create design for interested people in return for donations that fund HumanDHS's research activities. We wish to engage in building the Fourth Sector also in our work. On the website of the Fourth Sector Network this is explained as follows: "Over the past few decades, the boundaries between the public (government), private (business), and social (non-profit) sectors have been blurring as many pioneering organizations have been blending social and environmental aims with business approaches. There are many expressions of this trend, including corporate social responsibility, microfinance, venture philanthropy, sustainable businesses, social enterprise, privatization, community development and others. As this activity matures, it is becoming formalized as a ‘Fourth Sector’ of the economy." See also KaosPilots. We look for interested people, who would like to develop our WDesignED page. Please see our Call for Creativity. The following text has been retrieved from http://archnet.org/: Ramses Wissa Wassef was born in 1911 and died in 1974. He was an Egyptian architect and educator. He earned his BA degree from the Ecole Des Beaux Arts in Paris in 1935. His graduation project "A potter's house in Old Cairo " received the first prize by the examination board. Upon returning to Cairo, in 1938, he was nominated as a professor of art and history of architecture in the college of Fine Arts in Cairo. "One cannot separate beauty from utility, the form from the material, the work from its function, man from his creative art." In 1951, Ramses Wissa Wassef embarked upon an experiment in creativity which would become universally acclaimed. He set out to prove that creativity was innate -- that anyone could produce art. He had become discouraged by the general decline of creativity in 20th century urban culture and dismayed by the deadening influence of mass production. He felt that routine education was stifling. For his experiment he chose uninhibited, free-spirited young children who were isolated from many aspects of modern civilization. Wassef saw that the "modern architectural revolution", which had hit Cairo, was producing a multiplicity of buildings constructed without any sense of aesthetics but rather for their fast rentability. From this point on, Wassef was firmly resolved to never sacrifice his artistic vision for current trends of construction. It was in the course of one of his trips to Upper Egypt that Wassef discovered the beauty of the Nubian villages, where the houses are composed of mudbrick vaults and domes, a style that perpetuates a tradition goes back to the early Egyptian dynasties. This discovery revealed to Wassef the connection he had been seeking with the past. "I had just visited Aswan", Wassef commented on this discovery, "where I had been struck by the beauty of the Nubian houses in the villages of the area. I learnt that it was still possible to find bricklayers who could make vaulted roofs for houses. I was extremely excited when I thought that these same methods had existed since the first dynasties of the Pharaohs." 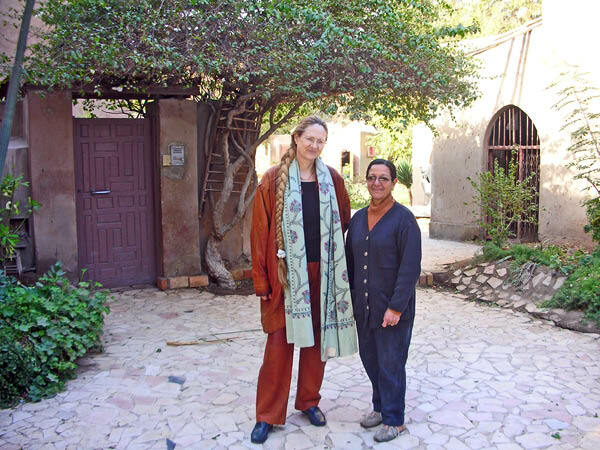 Evelin Lindner became acquainted with Ramses Wissa-Wassef's work through his widow and his daughters, whom she met in 1984. Ramses Wissa-Wassef's invaluable contribution to the world is his quest for creativity. Among his many achievements is his conviction that poor farmers' children, in the villages near the pyramids of Gizeh, should be able to express their imagination without "guidance" by experts. The success was impressive. Today, Wissa-Wassef carpets are priceless and decorate many a public building around the world. The richness of the themes - village scenes, plants, animals, people - is overwhelmingly beautiful. Ramses Wissa-Wassef liberated and nurtured creativity, excellence, and innovativeness, where others would not even have dared to even search. Since 1952 two generations of weavers have developed in the Art School Ramses Wissa Wassef established with his wife Sophie at Harrania, near Giza. 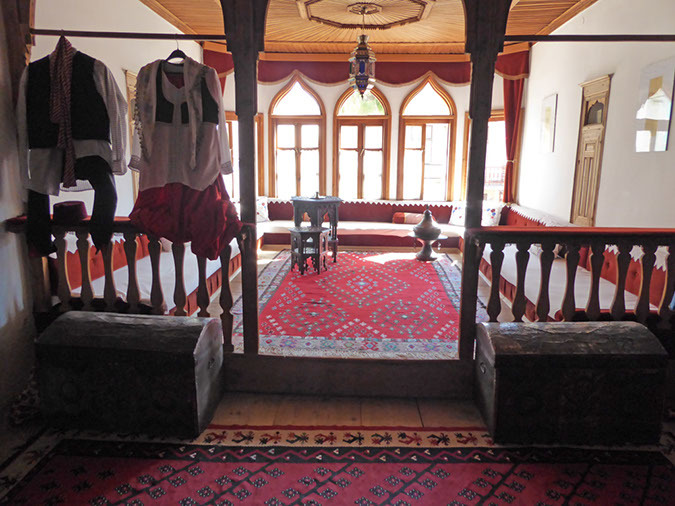 A second generation of weavers guided by the Wissa Wassef's daughters Suzanne and Yoanna, continue to produce wool and cotton tapestries that are remarkable and unique works of art. Please see http://www.wissa-wassef-arts.com/. See also Threads of Life, Ramses Wissa Wassef Art Centre, Egypt: A Journey in Creativity, by Ikram Nosshi & Suzanne Wissa Wassef. The following example is presented here in order to stimulate the discussion around diversity versus uniformity. Questions may be asked such as: How can we better honour and respect the dignity of individuals? Perhaps by nurturing their talents, perhaps by helping them unfold their potential, for example in the field of design? One place to express one's creativity and unique personality is in the design of one's home. Evelin Lindner admires Ramses Wissa-Wassef's courage and vision since also her guiding principles are creativity, excellence, humour, and innovativeness. In 1991, she designed her flat in a way that allowed for her creativity, phantasy and spirit to be expressed, instead of "ready-to-wear" solutions from shops. The flat was a studio of mainly one single room, where she lived from 1991-1994 (while organising the Hamburger Ideenkette, writing her doctoral dissertation in medicine, and becoming a candidate to the European Parliament). This one room had a wall of seven meters. She furnished this room sparsely, with futon matrasses, her PC, a stative for clothes, some mirrors, and no chairs and tables. She explains: "My starting point for designing a home is to refrain from being caught in categories of normality which indicate chains of associations such as 'a flat is, preferably, made up of a bedroom with bedroom furniture plus a living room with living room furniture, entailing chairs and tables, plus...' This list can be continued almost endlessly. Just to give you one example, I do not enjoy sitting in chairs. Chairs rigidify the body (Study: Sitting Up Straight Hurts Your Back). In contrast, I appreciate sitting on surfaces that allow for more flexibility, similar to how children usually like to move. I remember fondly my time in Egypt, where traditionally whole families sit on larger surfaces, made of matrasses or cushions, either on the floor or as mastabas. 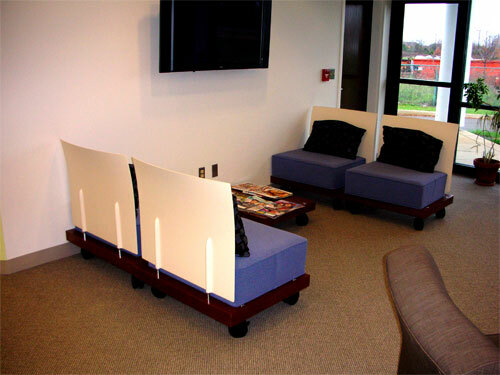 This allows for flexibility of movement, but also for closeness with others, if this is desired. Chairs not only rigidify, they also separate. My time in China and Japan, as in many other countries in South East Asia, was equally agreeable. 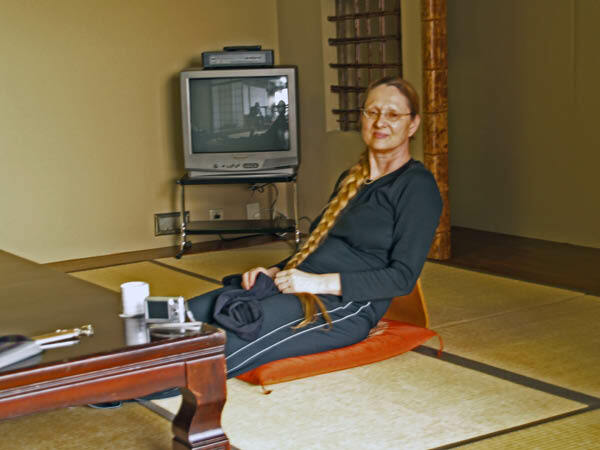 Squatting and sitting on the floor is something that looks difficult only to stiff Westerners. Westerners ought to abandon their arrogant assumption that chairs have something to do with 'civilisation.' An Iranian architect told me that back problems in Iran are on the rise in correlation with the use of chairs. Westerners ought to learn from the majority of the citizens of the world, namely that one can gain much for one's health merely by looking for alternative solutions for chairs. The problem with chairs is that its original function to elevate a person is lost as soon as everybody is sitting on a chair, and we are left with nothing but back pain. Chairs are like thrones, they give status; this was their original purpose. The chairperson, after all, leads the meeting, and a professor 'holds a chair.' On everyculture.com, we read: 'With its long history of hierarchical social relations, Rwandan culture puts great emphasis on practices of etiquette that demonstrate respect and emphasize social rank both inside and outside the family. Within the family, chairs are traditionally reserved for men, while other family members sit on mats on the floor. Men eat first, with women and children eating after. Visitors are given the best chairs and the first choice of food and drink.'" The pictures you see further down were taken in connection with the World Design for Equal Dignity project, where, among others, the role of chairs for status and health is discussed. The important point in this context is that Western design is rather uniform and has forgotten the use of multiple levels and various spaces. Western style presses its users into a rather narrow range of how to use the body and design relationships. This narrow range rigidifies the body and separates it from others, and this is not necessarily the optimal way of preserving one's health or one's social relationships. Introducing cultural variety and being aware that the range of possibilities is much wider than Western design allows for, would be beneficial. Please see Avoiding Humiliation - From Intercultural Communication to Global Interhuman Communication, an article by Lindner that argues that we need to "harvest" the beneficial practices from all cultures (and de-select the less beneficial). 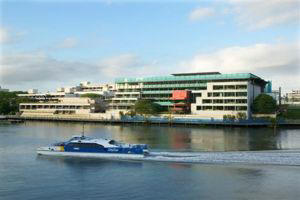 The pictures above are taken in the State Library of Queensland, slq, in August 2007. It opened in 2006. Please click here or on the pictures to see more photos. This library offers great spaces to visitors. See here the 1st floor, where visitors can sit and use their own laptops or the library's computers as they wish. Wireless access to the Internet is available everywhere. All is free of charge. The range of opportunities as to how to work is formidable. 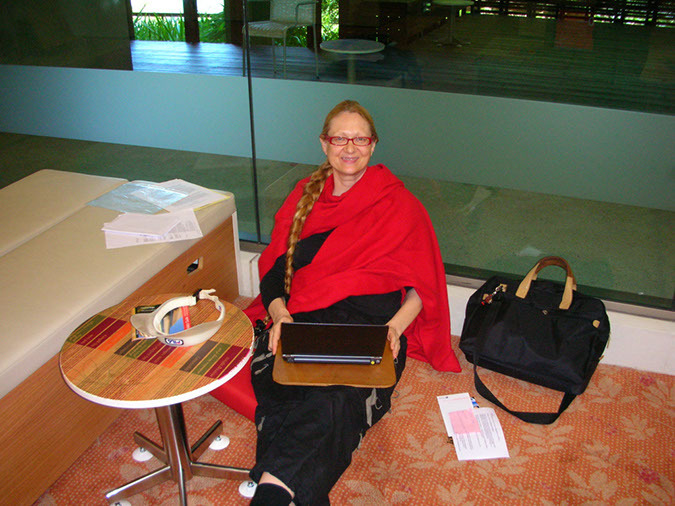 One can sit either on the floor, or on banks, or on chairs, or even work while standing. The versatility that is made possible is outstanding. 4) in the foreground (not visible on this picture), there are two Western-type tables with four chairs each. 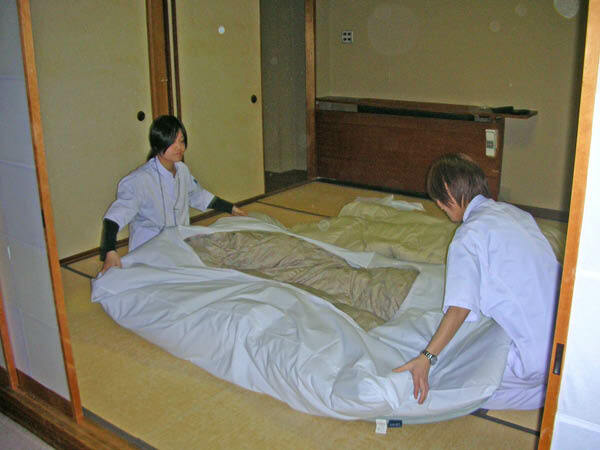 These are two pictures from Japan, where you see the low table and the futon bedding on tatami mats in an Onsen hotel in 2007. The above picture shows a Moroccan chaiselounge. 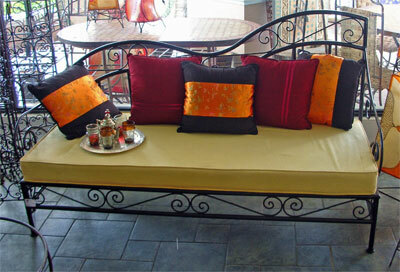 Any website on Moroccan furniture demonstrates the use of the floor for sitting, on floor cushions or puffs, up to having the floor platform "elevated and cut up" into all types of benches, sofas, or, as in this case, a chaiselounge. See a selection of items, for example, on Just Morocco. The picture above shows a modern version of an elevated platform, in this case on wheels (seen at Rutgers University, US, in November 2006). 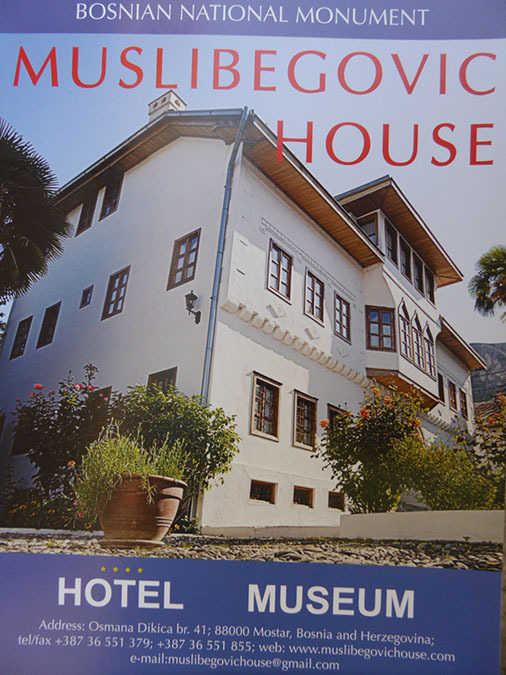 The Muslibegovic House in Mostar is another example of a slightly elevated platform that is entered without shoes, with long low benches along the walls covered with soft blankets to sit and lie on (24th September 2016). However, chairs are merely one minute example, many more elements of Western interior design are, at least to my view, dysfunctional and hamper both the physical and psychological well-being for their inhabitants. However, this is a long discussion!" 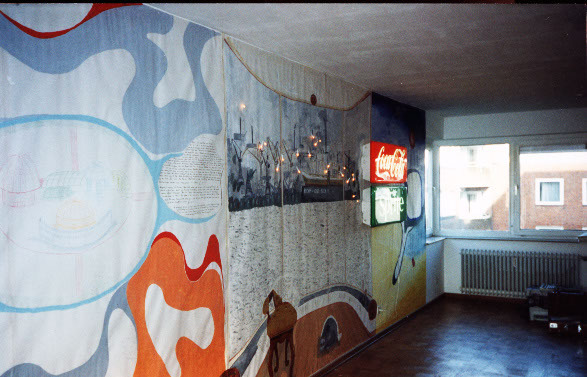 The main "attraction" in Lindner's studio was the seven meters long wall which she covered with a painting/installation containing three sections. She combined a variety of elements, from humourous and playful elements to optical illusions. The middle section of the installation shows the view of an illusionary balcony, with a window out on the harbour of Hamburg. On the balcony you see a chair, half painted only, with text emerging from it. The text represents a humurous message to imaginary thieves intending to steal this furniture, informing them in a funny way of the supposedly high value of this chair. Furthermore, you see a cat sitting on the balcony, and the walls of the balcony are adorned with masks that are reminiscent of what we see in Asian Temples. The left section shows in a center piece Lindner's vision of an architectural expression of the global village. Her idea is to take the notion of the global village as starting point and translate it into a architectural project that embodies the positive aspects of globalisation. Such aspects are, for example, the emergence of a One-World awareness, and an appreciation of the necessity for all of us to live together in ways that allow diversity to flourish on the backdrop of respect for equal dignity. In sum, the painting/installation that Lindner created, expressed her playfulness, her ideas, vision, and creativity and turned a studio that otherwise was rather bland into an exiting place, a place that was tailor-made to her specific individual needs and love for innovation. This was achieved with a minimum of material resources, much less than the "usual" design and furnishing would have demanded; anybody can embark on buying some paper and paint. In other words, this is an example not of any high-flying artistic expression, beyond "average people," but a down-to-earth personal expression of creativity that is open to any "average person." In 1994, when Lindner left the place, her painting was taken off the wall and rolled. It is now stored. 1. on the left: The idea to cover buildings with extremely large and flexible roofs depicted on the left side (as part of the idea to actually build the "global village"), increasingly emerges in our built environment since. The 2008 BBC programme Bionic Buildings offers interesting illustrations, for example, Kingsdale Foundation School. When I came to Norway, for the first time in 1977, I had a Norwegian partner (later husband), who was to inherit a farm in the countryside of Telemark. I was deeply impressed by the Norwegian layout of farms, particularly by the beautiful way farms were (and still are today) melding with and adapting to the landscape. There was an organic flow and rhythm to the way farm buildings bonded with the hills, mountains, trees, and alleyways around them, unlike modern architecture that often tends to rashly dominate its surroundings by imposing stark rectangularity. Usually, a Norwegian farm entails at least three larger buildings, the barn, the stable and the house for the people to live in. My interest was caught by the barn. I love the experience of space, of pure space, when standing inside a building, as, for example, such a barn. 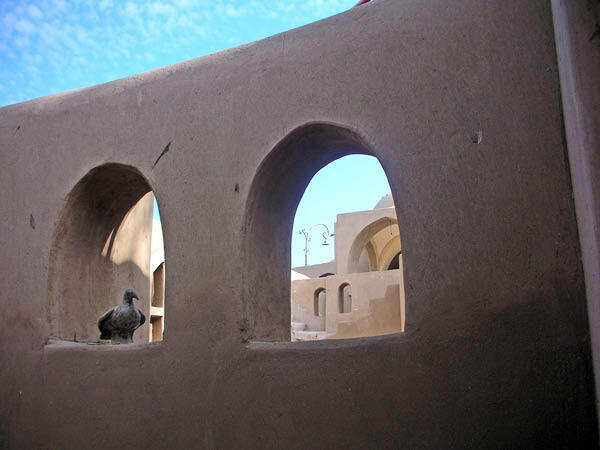 Later, I experienced the same joy over pure space when I became acquainted with the work of Hassan Fathy in Egypt. Fathy's architecture of domes and vaults celebrates the experience of the space of an entire building rather than getting lost in details. Now turn your attention to the four corners of the big hall/space. Each corner would contain a cubicle with a door. One cubicle would entail the kitchen, the other the toilet and shower/bath, the fourth and fifth rooms would offer people who wish to be alone this option. I imagine the hall to be so big that these cubicles would be small in comparison. Now look at the walls. I love creating imaginary landscapes by creating paintings, photos and sculptures that "grow" out of the walls. All walls would be covered with my art. People, who listen to this description, usually make the point that such a large hall cannot be heated in winter, at least not in colder world regions. I propose a kind of bell-shaped transparent cover that can be lowered from the ceiling down over a smaller central area so as to preserve heat under it. During summer, this structure would hang under the ceiling, or be removed. Clearly, my house cannot be part of a suburban housing area where rows of houses are aligned on pieces of land that are separated by fences and neatly cared-for lawns. If not in the Norwegian country-side, perhaps it could be placed on top of a skyscraper in New York or on the top of a cliff overlooking the ocean on the coast of Iceland. When I first imagined this house, in 1976, I thought I would "populate" it with my husband and children - I hoped to have many children. I myself work best by being surrounded by people I love, everybody being busy with whatever their interest is, me sitting on a futon, with my laptop on my knees, with books scattered around me. During the first six years of my life, I indeed experienced such a set-up, at least to a certain degree. I lived on a farm in a rural village (in Western Europe), and this was at a time, when farms were not yet industrial plants run by one or two persons; it still represented the traditional arrangement with many people and many animals living together. I loved being part of this larger set-up. Later, when I failed to realize my dream of my own biological family, I thought I should build a house where my space would be located on top of a first floor of rooms for students, and that my space would be open to these students to join me. However, my life has since changed in ways that have made it increasingly unlikely that I ever will realize my dream, even though, in some unexpected ways, I have realized it. I am now part of a global extended family/global group of friends and have built a virtual global house for me (HumanDHS). The only difference to my dream is that I, in my day-to-day life, join others, instead of others joining me. However, my dream of my house is still there. Yet, the idea has never been tested in reality, and I am sure it would have to be adapted in case I would ever try it out. My vision of my house expresses my doubts as to the functionality of mainstream housing design. I am critical to mainstream design of living space, of furniture as well as definitions such as "living room" or "sleeping room." Follow an average couple in a Western society. Many sit in a sofa or couch and watch television in the evening. Some try to sit close to each other, however, the design of the couch, with a table in front of it, does not allow for it. The man often tries to put his feet on the table, but will be reprimanded by his spouse. Both will try to keep up a behaviour that is defined for the public space, while in their private space. Their need to relax together in a way that allows for closeness and flexible movement is not acknowledged. There is not sufficient space - everywhere there are corners and limitations causing bruises, literally. Since around 2005, couch design in Western furniture shops has begun to respond to this incompatibility between keeping up facades and needing intimacy; living room furniture now entails one part that resembles a chaiselongue. This chaiselongue-like element allows for the more relaxed lounging of at least one person, yet, still, it is too short, and it is too narrow for two people being able to comfortably lie close to each other. In other words, the needs of a couple relaxing together in the evening in front of a television are thwarted by their own furniture. Since I am at home in many homes around the world, I witness this painful evening struggle in many variations. Let us follow the couple further. When they are tired, they retire to the bathroom, clean their teeth, and then they "go to bed." The bedroom is a storage room, where both clothes and people are being stored. In the five minutes before they fall asleep, the entire intimate life of the couple is supposed to take place. Living space design forces bodily closeness between spouses (to a certain degree also with children) into a either/or dichotomy, either you sit separated from each other, one by one, in chairs, or you lie together in a bed and make love. It is no wonder, to me, that intimacy, which needs nuance and time, cannot grow - it finds no space to flourish. By design, in such a set-up, understandably, intimacy is bound to disappear, unless the couple abandons this script. Either they have to turn the sleeping room more into a living room, or the living room more into a sleeping room. They have to take the larger soft platform that a bed offers and combine it with the soft back support that a sofa provides, and introduce this into their evening life. They have to redefine public and private behaviour. No furniture shop offers this alternative. Do we wish to engage in "voluntary self-humiliation" in exchange for status? The main problem seems to be the definition of public versus private space and the calibration of the use of both. At the heart of public behaviour seems to be stiffness, for example, stiffly sitting on chairs. Chairs, however, are not made to promote even the basics of human health, let alone closeness for a couple. They produce rigid people with back problems, if used for many hours. An Iranian architect reported to me recently, "Since we have chairs in Iran, we have back problems." I discussed this with a known Norwegian chair producer. Their verdict was, "The human body is not made to sit on chairs. There is no way to make a chair really 'ergonomic.'" Incidentally, squatting is a very beneficial exercise, from the anatomical point of view. In recent years gynecologists have admitted that giving birth in bed is convenient for the attending doctor, but not the best position for the woman. Defecating and giving birth are both aided by squatting. Apart from squatting, all is beneficial which promotes the overall flexibility of the body. Children do the right thing when moving around on the floor or bed when they do their homework. Learning to sit stiffly is not a healthy lesson to learn. A good Egyptian friend, who recently had become wealthy, proudly built a Western house, a concrete "container" filled with pitiful imitations of Western furniture, Louis XIV or XV styles. He and his family were accustomed to squatting, but he packed the new house with chairs and fauteuils that nobody ever sat on. The only purpose of this furniture was to cater to and impress the Western guest. The new house had a modern kitchen, but no courtyard, where his Egyptian family used to cook their communal meals. The family had no alternative but to huddle in the small, windowless corridor on their carpets to recapture some of the life they were used to living, misplaced in their fine new house. In 1999, I participated in several fieldtrips in Rwanda with the United Nations Development Programme (UNDP) and with international and national Non-Governmental Organization (NGOs). These trips became a series of informal focus groups in which I discussed the topic of humiliation. I monitored not only other people's feelings of humiliation, but mine as well. I shared my shock and humiliation at the way shelter programs were designed and built. To me, many design aspects of these "villages" represented the flagrant humiliation of humanity through an uninformed admiration of outdated concepts of "the state of the art." The design of these artificial villages, corrugated iron sheets on huts set in a military layout, reminded me of the same antihuman philosophy that inspired the Plattenbauten (ugly tower blocks) architecture in the socialist East, which today are regarded as a shame by almost everyone, West or East. Obsessive rectangularity and military uniformity is an obsolete concept, and few are proud of having ever admired it. The socialist belief that uniformity (from clothing style to architectural design) would heal past humiliation and promote equal dignity commits the very mistake it aims to remedy. I have a label for the veneration of dysfunctional status markers: "voluntary self-humiliation." Egypt was colonized by France and learned to imitate Versailles in the same way the rest of Europe did (and all around the world, even today, most so-called "international" hotels or luxury houses still do this). Rectangularity, on the other side, acquired idolization through the success of mechanization - I call it the "machine paradigm." Public behavior, defined as sitting stiffly like a machine, on furniture preferably inspired by the taste of the court of Versailles, all this is meant to display status. The problem is that it is detrimental to quality of life, at least if generalized and allowed to invade private space. Undoubtedly, Versailles does represent a wonderful high culture and its artifacts, even copies, can be pieces of art. And if its beds were as accepted as status markers as are its chairs and tables, it would be a different story. However, combining its chairs and tables with the machine paradigm, and using it to define private space, equals "voluntary self-humiliation." It is like old Chinese foot binding: you gain status (a woman acquires the status of being "beautiful" and "marriable") at the prize of self-mutilation. Or, it is like wearing high-healed shoes all day. High-healed shoes, when produced well, can represent pieces of art, and wearing them for short time period, for a festive occasion, does not cause too much harm. Wearing it all the time, however, resembles foot binding. Similarly, it is fine to have one "status" room in the house that imitates Versailles, and to sit there stiffly, for one or two occasions per year, as was the tradition in Western contexts in many houses until recently. This room was usually locked, not heated, and only opened a few times per year for specific festivities. If this room is small compared with the rest of the house, the status gain may be worth the only limited damage to quality of life. However, if this room eats up too much living space, like in the case of my Egyptian friends, it resembles foot binding. If this kind of public-status style invades private space with its unhealthy stiffness, private space is no longer private and the price for status gain becomes too high: bodily and psychological well-being and health are damaged. Human beings are living creatures and I posit that pressing them into machine paradigms is detrimental to them, whatever "inspiration" a machine paradigm might have (I see mainly two historic contexts that gave rise to machine paradigms: firstly, it can be found in historic contexts of war, when the attempt was made to mold males into warrior machines - not seldom turning them into monsters, and secondly, it gained currency when the principles of mechanization brought seeming success and were "misunderstood" to confer higher status also in other - I would say unsuitable - spheres of life, namely human and animal life). At the 2005 Aoyama Symposium on International Communication, entitled "Exploring the Current Status and Future Direction of International Communication as a Field of Study" (Aoyama-Gakuen University, Tokyo, March 5, 2005), Richard Evanoff, a professor at Aoyama-Gakuen University, told the following story: Richard, himself from a Western background, is married to a Japanese wife. When their first child was born, his wife wanted to have the child sleep between them. 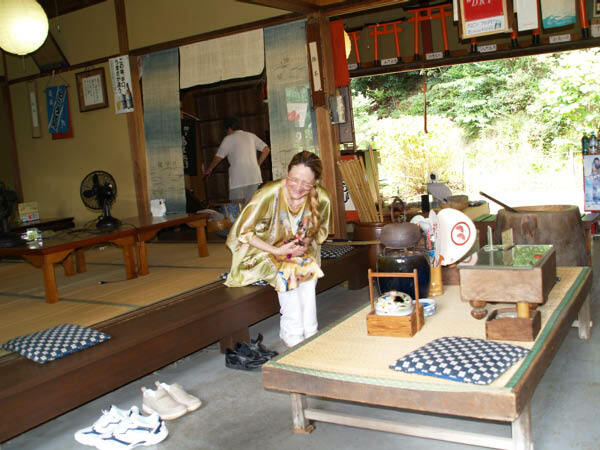 She explained to him that Japanese culture indicates more than kinship, namely skinship. The concept of skinship, she told him, can be illustrated by the Japanese kanji character depicting a river (three parallel lines), meaning that the wife and husband should sleep on the sides, with the child in the middle. He, Richard, in contrast, wanted the children to sleep alone in their own room. The couple found a way out of their seemingly irreconcilable positions: their children do not sleep between them, but alongside his wife. In other words, between themselves, Richard and his wife developed new cultural norms and new cultural processes that suited them all. And, who knows, the Japanese concept of skinship might be an important cultural concept to study also in the Western world with respect to health and well-being for individuals and society (to separate children and to "put them to bed" in a separate space seems to be a "dogma" only in Western cultures, while the rest of the world - not only Japan - does not subscribe to it in the same way). How important is skinship, we may ask? How damaging is it if we succumb to a culture prescribing separateness and stiffness, too early in life and for too many hours per day? Well-known late South African educationist Pieter Pistorius (1981) formulated, "The child needs our presence, not our presents" (in his book Kind in Krisis, 1981, Capetown, Human & Rousseau, p. 64). He reports on ethnologist Margaret Mead (pp. 42-43) and her analysis of child rearing in two tribes inhabiting two different sections of a South Sea island, separated by an impassable mountain range. All members of the two groups looked alike, shared the same language and customs, and ate the same kind of food. Yet, the people on the one side of the island were friendly and gentle, in contrast to the inhabitants on the other side, who were quick-tempered, suspicious, and aggressive. Mead found that the mothers of the friendly tribe stayed near to their babies, picked them up as soon as they cried, caressed them, and fed them. The mothers on the other side left their infants to cry until they were out of breath before picking them up. Those babies, enraged, suckled, but their rage became a permanent part of the child's temper, concluded Mead. As recorded by the thirteenth century Franciscan Salimbene of Parma, in 1248, Holy Roman Emperor Frederick II conducted an experiment with the aim to find out the "original" language that people would speak who would never had the opportunity to hear a word in any language. He took a number of newborn babies and instructed their foster mothers to bathe and suckle the babies, however, not to fondle, pet, or talk to them. All the children died. Another related experiment, albeit many centuries later, was provided by Harry Harlow in his primate lab at the University of Wisconsin. He used Rhesus macaque monkeys, who share roughly 94 percent of their genetic heritage with humans. Attachment had previously been defined by nutritive rewards: We love our mothers because we love their milk. Harlow questioned that theory. He took a group of newborn rhesus macaque babies and put them in a cage with two surrogate mothers: one "mother" was made of wire, full of food, and another "mother" was made of soft cloth with an empty breast. Within days, the baby macaques transferred their affection to the cloth surrogate. However, since the cloth mother had no milk, they ran to the wire mother, however, only for the briefest time span possible. Harlow measured the mean amount of time the monkeys spent nursing versus cuddling and established that love grows from touch, not taste. See Lauren Slater (2004) and her article in The Boston Globe, March 21, 2004, at http://www.boston.com/news/globe/ideas/articles/2004/03/21/monkey_love/, for a nice accessible description. To summarize, I propose that we abandon cultural guidelines for life that require self-mutilation and that we redefine "beauty" and "status" in ways that are more functional for our quality of life. It is no natural law - it is rather a cultural caprice - that sitting stiffly on chairs became to mean higher status. My dream of my house, if realized, would strive for a more creative and free expression of beauty than merely imitating bygone elites (Versailles) or generalizing successes in fields that should be kept separate (human beings resemble living creatures more than machines). The purpose of my house would be to bring a more thought-through definition of quality of life to its inhabitants. My aim is to redefine status, public space and private space. Three (or four) questions for Toby Israel Posted May 24, 2016. The 'tactile' work environment may affect decision-making If you want to negotiate a tough deal, make sure you are sitting on a hard chair, say US researchers. In a mock haggling scenario, those sat on soft chairs were more flexible in agreeing a price. The team also found candidates whose CVs were held on a heavy clipboard were seen as better qualified than those whose CVs were on a light one. It shows that the "tactile environment" is vital in decision making and behaviour, they report in Science. Overall, through a series of experiments, they found that weight, texture, and hardness of inanimate objects unconsciously influence judgments about unrelated events and situations. It suggests that physical touch, which is the first of sense to develop, may be a scaffold upon which people build social judgments and decisions, the Harvard and Yale University researchers said. Please read more at http://news.bbc.co.uk/2/hi/health/10408041.stm. See also the Science Magazine. Read the entire article at http://news.bbc.co.uk/go/pr/fr/-/1/hi/sci/tech/6938699.stm. Cocolico presents green design. It aims to helps societies grow without harming common ressources.